I like the Pirates' date=' which is painful. I'm warming up to the Braves since they are the closest team to me, and I like the Giants as well. Yea, it's always nice to see the Yankees drop games like that. Do you think the Cardinals are heading for the World Series again this year? Yea, that's what I think. Pujols was a staple in the Cardinals offense. Without him, they don't look like a World Series team. 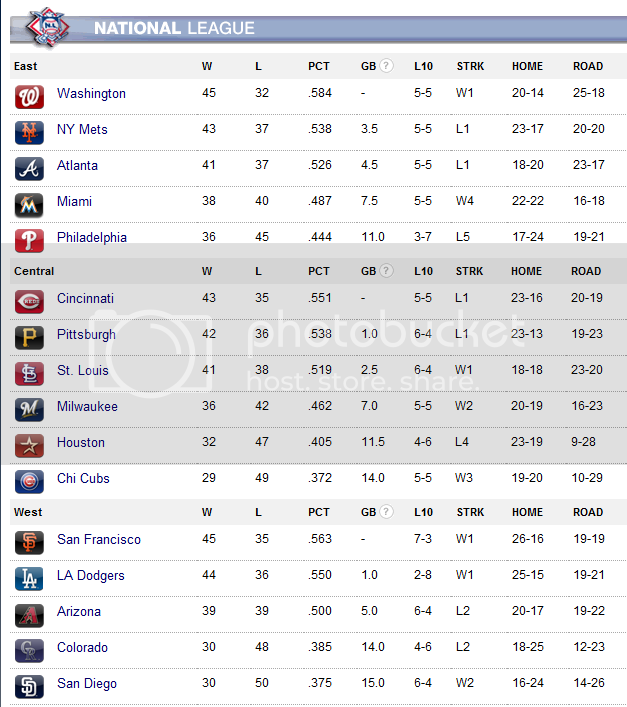 But since no one else in the division should give them much trouble, I see them in the postseason. Haha yeah maybe the Pirates will make it interesting! Nah, you won't do anything big The Mets on the other hand, they're looking strong this year! Are the Mets really? I haven't been paying much attention to them. I wouldn't mind if they made things interesting. Did you see this inside the parker? St Louis now 5-2, topping the NL Central. St Louis are 4-0 against the Cubs at the moment, which is great, we opened up a can of whoopass in the bottom of the fourth. Although we did lose and we're 5-3 at the moment. Yea, me too! St. Louis still going strong, and if I heard correctly the Dodgers are 7-1? I didn't see that coming. Yeah, that's definitely unexpected! Kershaw and Kemp were great last year for them, I like Kemp as a player anyway, and it seems that at the moment they're doing well too! Awesome! What a reaction! And barehanded too! Did you see the Yankees come back from a 9-0 deficit against the Red Sox? Impressive, but I still hate the Yankees. Also, best wishes and prayers to Mariano Rivera, it's a shame he tore his ACL. I hope it doesn't end his career. Haha, that's great. Thanks for posting the video, that's the first time I've seen that. 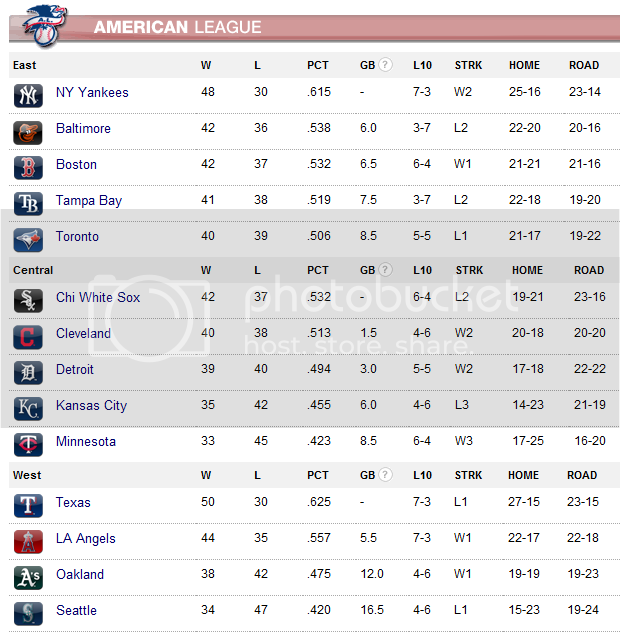 Standings as of now. Today. Whatever.